Audrey stared at the woman, studied her, trying to make sense of what I told her. “Girls, be on your BEST behavior.” I explained that one hairdresser at the salon didn’t like children. I had to bring all 3 of my young daughters with me. Margaret was 6; Hazel was 4; Audrey was 2.5 years. “Why doesn’t she like kids?” Audrey couldn’t stand the unfairness of blanket prejudice. “I don’t know really. Kara just said she doesn’t. Maybe she thinks they’re too rowdy in the salon? But I just want you girls to be very well-behaved. All you can do is prove people wrong.” Hazel and Margaret nodded. “I’ll just go up and kick her.” Always Audrey. Audrey Eva Rose born March 10, 2005. My third daughter in a row; she’s 11 now. She’s a natural comedian; you can’t fake that–you’re either born with it or you’re not. She is full of compassion for any underdog or injustice that she discovers. She is also full of sass. She was the youngest for 8.5 years, and I admit I let her get away with the most for many years. “Well…if she doesn’t like ME, then I don’t like HER.” Her scowl was adorable, but it also broke my heart. I can’t make this world a fair place for my girls. I can only help them cope their best in the world as it is. Hazel’s haircut was finished, and it was Audrey’s turn. Hazel moved cautiously, smiled shyly at the child-hater next to Kara, our hairdresser. The woman didn’t look at her. “Just trim it all over, maybe do a stack in the back. Audrey’s hair is finally growing, and it’s getting wispy on the ends.” My 3 oldest girls were all essentially bald until about 2 years old. Audrey was turned away from the mirror. She was very still and quiet while the scissors snipped and tufts of fluff fell. Her eyebrows stayed knitted together, and she kept a close eye on the child-hater. Snip, snip…hair fluttered down…snip, snip…flutter, flutter. “Well, what do you think?” Kara spun Audrey around to face the mirror again. She sprayed a light coat of hairspray. “I look like a MOM.” The pensive suspicion on Audrey’s face switched to toddler giggles instantly. She did have a Mom hairdo. “My hair looks like hers.” She pointed to the child-hater. Audrey’s giggle is infectious. The lady didn’t look in our direction, but we didn’t need her approval. We joined Audrey in a lovely laugh at her silliness. “What is that?” I pointed to the desk drawer across the room. I felt my stomach tighten. It looked like doll hair hanging out of the drawer, but it certainly looked like the exact color of Audrey’s hair. Audrey was 3.5 years old now, and her hair was finally getting long. “Looks like some doll hair.” Chad hoped. I opened the drawer. The hair wasn’t connected to a doll. And there was lots more. “This is Audrey’s hair.” We had gone out to eat, and her grandma had watched the girls that evening. “Well there’s nothing we can do about it tonight. Just let her sleep, and you can check it out in the morning and make her an appointment to have it fixed.” Chad was always logical. The next morning I woke Audrey up first thing. I needed to know if her hair was an inch long in places, or what the damage was exactly. The look on her face was like–oh yeah. I forgot about that. I was hoping it had been a dream. “Well…come here, let me see it.” Her hair was chin-length…in the front only, none was cut super short. She must have looked in the mirror and cut all that she could see, forgetting that hair also exists on the back of the head. Newscaster in the front, party in the back. “I’m sorry.” She must have realized that the desk drawer was not the best hiding place for her excess hair. “Okay. I won’t.” And she hasn’t. Except for a few minor trims, she hasn’t cut her hair since that day. It is soooo long and beautiful. However, she is planning to cut off 8-10 inches this year to donate it. I curled and teased and hairsprayed her mullet. I can’t stay mad at that sassy kid. She’s too much fun. She was pretty sad that she had to have her hair short again, but that sadness didn’t last long once she saw it. “I look good.” She posed and posed. Bottom 3 photos–I look good. These are the times that try moms’ souls. Every day is a battle, and we don’t win every time. I’ve never been in a war; I’m at war every day. Most days, I don’t even see the battles. I fight with every bit of strength I have. I fight hard. I fight proud. I fight long hours. I fight with purpose. And other days, it’s all I can see. Every mess at my house. Every financial worry. Every springtime ant crawling into my home to steal my joy. Every carpet stain. Every toy. Every bit of mold on the shower tiles. Every pair of shoes left out. Every pile of dirty laundry. Every pile of clean laundry. Every smudge on every mirror. Every crumb on the floor. Every pair of pants that no longer fit. “Here, Mommy. Here.” Clara brought me a whole roll of toilet paper. I cry a little harder that she knows the drill. I cry a little harder that her heart is so kind, and her love is so pure. She lays her head on my lap and rubs my arms with her soft, soft hand. She sits up, puts her soft hand on my cheek. “Are you sad, Mommy?” Her words creep out of the corners of her mouth while she clenches her pacifier with her teeth. “I’m a little bit grouchy. I’m tired. I’m a little bit sad.” For all the things I’ve done wrong in raising my girls, I must have done some things right. They know how to step in and help in the most loving, giving ways. All of them. “It’s okay, Mommy. Let’s lay down.” And we did. And I napped instead of fighting my battles. It is okay. Just go lay down. The battles will wait. Listen to the wisdom of a 2 year old. You have to take care of yourself too. Moms are the absolute worst at doing that. It’s not selfish. Yet…we feel guilty. It’s actually a lot better for everyone if Mom gets some care, too, but we don’t make ourselves a priority. We give and give and give and give…until we have a meltdown. I’m sorry I cry so much. I’m not mad. I’m not depressed. Everything is okay. I win most battles. I lost a battle today. Tomorrow is a new battle. And I feel determination welling in my chest. I will be victorious. His side of the closet was nearly empty. I arranged the few things that were left on the clothes bar to try to make it look full again. What would be gone this time when I returned? I would burst back into the house bravely to scan it over quickly. What’s missing now? But I didn’t always figure it out. Usually I would notice later, in a weaker moment–some DVDs, his protein, more shoes, a large stack of diapers. I guess he couldn’t face me. Maybe that was best since I couldn’t hold myself together anyway. But it felt so much more cruel. I am your wife. When did I become your enemy? “Hold on to it, and just pray.” We got off the phone. I wrapped my arms around his remaining shirts. Oh, Demetrius, the clothes you don’t wear, they are soaked with my tears and prayers. Clara was playing on the floor with a photo of Mommy and Daddy, actually the first photo we ever took together. I took a quick snapshot of her as she stared up at me concerned. I scooped her up and hugged her. “Everything is okay, baby.” I don’t have the option to fall apart. God, please help me through this, I am not strong enough. Please fast forward my life 6 months from this moment. I don’t want to feel every second. I sprayed my perfume on his clothes. Held them. Prayed. Maybe you won’t face me, fine. Then you can smell me. How did the heart of my husband become frozen, God? I grabbed onto his warm arms in this very bedroom, gave birth to his daughter in that very bathtub. How? And why? Which one is the real Demetrius? I want to sincerely thank A Mother of All Trades for nominating me for my very first Liebster Award. Take some time to check out her blog using the hyperlink. I googled this award to try to learn a little more about it, as I’m incredibly new to the blogging world. Very honored, and thank you again, Jennifer. I feel like I have some decent stories to share. 2. What was the last movie you saw, and did you like it? Daddy’s Home–yes, I liked it. 3. If you needed a pick-me-up, what song would you turn on to cheer you up? 4. What is one of your pet peeves? 5. What are some things you’ve crossed off your bucket list so far? Any meal with all our kids; I don’t care what we are eating. 7. If you could meet any blogger in real life, who would you choose? I don’t know yet, honestly. My parents coming to watch me cheer at football games. 9. What do you dislike about blogging? 10. If you were stuck on an island and could pick one person to be stuck with, who would you pick and why? My husband Keith–he would get us off of there, and in the meantime, I’d be with my favorite person. “No! She’s not hungry! She just nursed for an hour like 10 minutes ago!” My body is not mine. I am pawed at, drooled on, pulled on, clawed, sneezed on, tugged on, tapped, peed on, stepped on, sucked on, puked on, grabbed, pushed, coughed on, cried on. I need a soundproof door and walls for my bathroom. They will find you. They know that you must certainly be lonely for their company…alone behind that locked bathroom door. I lay down exasperated, exhausted, annoyed. But look at her. I pull Rebekah in to nurse, now feeling guilty. But just…look at her. I start to nurse her; her tiny toes climb and grip my stomach. Siiigh. Look at her. I have her cradled in one arm, elbow propped on a pillow. She is grabbing and clawing at some of my most sensitive skin. I press the thumb of my free hand into her palm. She wraps her tiny fingers around it tightly. Her wide innocent eyes are fixed on me, full of trust. I’m washed over by a calm sent from God Himself. A peace that words cannot express. I relax into this moment. So much simple precious beauty. Nursing the baby who lived and grew inside me. Her breathing slows. My mere presence comforts her. We need our sanctuary. Skin to skin, all she ever knew. I warm her toes in my hand. Holy moments of near silence. She needs me. I need her. “Who cut the toothbrushes? We aren’t leaving this room until SOMEONE tells me the truth!” I had just bought them each a toothbrush with a tiny suction cup on the bottom. JUST bought them, like maybe the day before. Well one of my girls decided to use the nail clippers to turn each suction cup into rubber fringe instead, defeating the whole purpose that I bought them. Margaret was 6; Hazel was 4; Audrey was 3. “No dessert. And we aren’t going to the park, unless SOMEONE tells the truth. So I’ll wait.” I couldn’t tell who it was. Usually the guilty party will get squeaky-defensive voice or break down and start crying. “Do I just need to give you ALL a spanking? Who did it?” I sat down in a chair with my arms crossed, facing them. Margaret’s tiptoes reached the floor; Hazel feet swung; Audrey’s knees didn’t even bend over the couch edge. All big eyes, all making eye contact…I couldn’t tell. I looked from face to face. Hazel looked uneasy. Aha! Years later, when the girls were probably 7, 8, and 10, Audrey told me the truth–SHE had cut the toothbrushes that day, and just sat and watched Hazel take her spanking for it. Well Audrey got her spanking 4 years later, and when I asked Hazel why she lied, she said she just wanted everything to be okay again. Hello Hazel. Hazel Ann Charlotte, born August 9, 2003. She’s 12 now. She likes everything to be okay. She loves to save her money, go to bed early, keep her room clean, wake up early and bake muffins. She is very easygoing about 95% of the time, but that 5%…whoa. We have learned that it’s best not to let her get too hungry, get a headache, or stay up too late. She CAN have a bad temper, but mostly when she was much younger. I put the smallest amount of mascara and lipgloss on the girls. 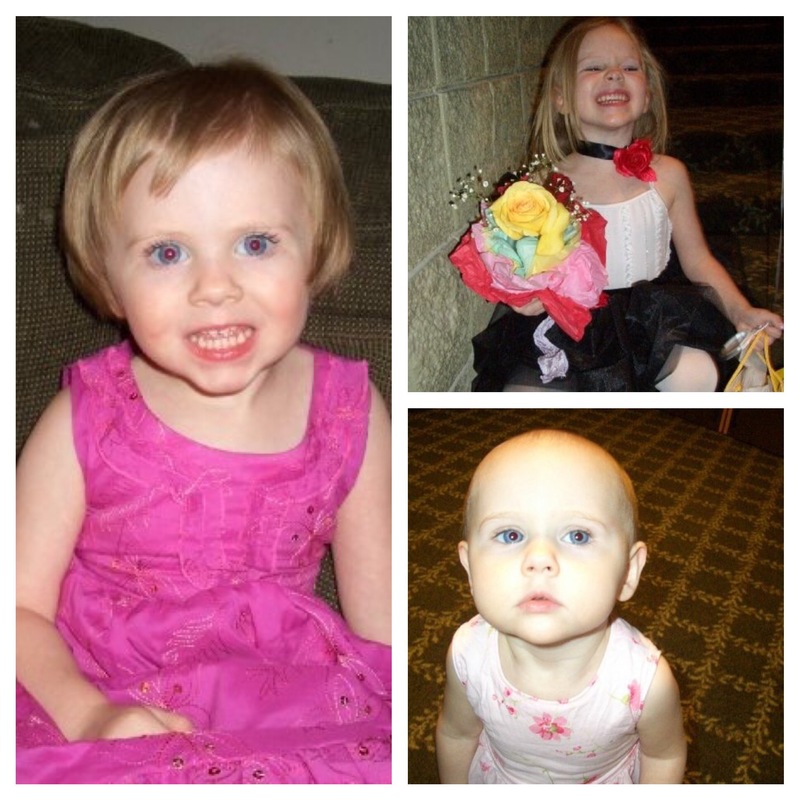 It was May 2006, Margaret was 4; Hazel was 2.5; Audrey had just turned 1. Margaret was in her tutu, ready for her first dance recital. I was a little worried that Hazel might be sad/jealous, so I had bought her a ruffle-y new dress to wear and spent time fixing them both up. Margaret and Hazel were twirling in front of the mirror and admiring themselves. They looked so sweet and pretty. “You girls look so pretty.” They both fluttered their lashes. Margaret had an I-know-smile; Hazel had a sweet, shy smile. “Well…I-I look pretty.” Margaret said. Hazel scowled. Margaret looked at Hazel, twisted her mouth, said nothing, and then went back to looking at herself again. Hazel little lip started quivering. “I wouldn’t care. Because that’s not true. So I don’t care if you say that.” Margaret shrugged and held her hands out, palms up. Looking like…do you people hate truth? Hazel tackled Margaret. Tights and tutus and ruffles flying. “Aaa!” Someone knocked Audrey’s lipgloss chew toy out of her hand. “GIRLS!! STOP!! Okay, okay…let’s get you all strapped down! Load up for the recital!” I would have to sort this out in the van. 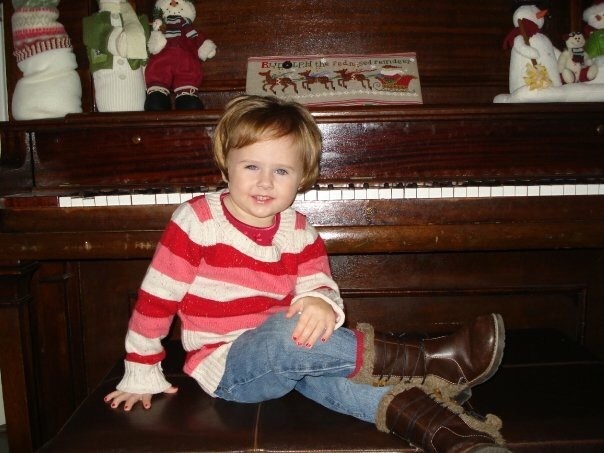 Hazel, you were bald until you were two, so I think the small amount of short hair you DID have by the time you were 2.5 was soooo cute. Actually you weren’t completely bald; you had an old-man-horseshoe of hair around your head and sparse fuzz on top. Margaret and Audrey were also both bald until age 2. Margaret might state ridiculous opinions as facts, but it certainly doesn’t make her right. Your short hair was precious. Hazel helped Margaret lose her first tooth. Margaret wouldn’t let me touch it; the tooth had been dangling for days. Honestly, I don’t remember what the fight was over, but I just heard screaming. Margaret runs to me with blood dribbling down her chin. Hazel stomps in behind her with an angry scowl on her face. Audrey is looking around like–huh? What’s all this? “Hey hey…what happened? !” Margaret is drooling in both hands, her tooth falls into the drool puddle. Margaret can’t manage to talk through the drool and panic. “I hit her in the face with a Bible.” And so we were all reminded–THIS is why we don’t anger Hazel. THIS. “Who is it?” Nothing else made sense. “What are you talking about? This has just been a long time coming. There isn’t someone else, Emily.” He avoided eye contact, inched toward the door. “You can tell me straight to my face, like a man. Or I can find out on my own. If you have any respect for me, you will tell me yourself, Demetrius. I may have made a million mistakes with Norman, but at least I had the decency to tell him the truth about you when I left.” There’s no honor among thieves. “There’s no one.” The most painful dichotomy–hearing words you wish were truth versus your heart-twisting in pain, your gut tightening in self-pity, your mind racing…knowing it’s all lies. “I’ve seen other women get obsessed in this position…combing through phone records, flipping out over every little thing. Just tell me upfront. That’s fair. That way I can begin the healing process and keep what dignity I have left in tact. I don’t want to put myself through the insanity of trying to figure it out. I don’t want to do that.” But I did it. “Because it doesn’t add up. Yeah we fight–that’s married life. I haven’t done anything so awful that I deserve to be left. For better or for worse, it’s a gamble. I guess you think you ended up with worse, but you took those odds.” I held Clara on my hip and followed him around as he packed things. None of this made sense. He was loading his tv and xbox into his truck. Did he just need a break from it all? This isn’t real. If I just sit home and pray and cry, it will all fix itself. If I don’t tell anyone, it isn’t really true. “Are you wearing your ring?” I tapped on the window of his truck. He rolled it down. “Why would I?” I couldn’t see his eyes because he had sunglasses on. But I saw an unmistakeable flicker of a grin on the corners of his mouth. “I’m going to keep wearing mine.” I held up my left hand. I stood there like a pathetic moron as he drove off. I don’t know you anymore. And the new you isn’t an improvement. Don’t be this person. You have a choice. Your life is a delicate, exotic, intricately blown-glass chandelier, hanging from a precarious thread over a cold, pristine marble floor. Sometimes someone will cut that thread, and walk away before it hits the floor. It may be someone who made you promises; it may be someone you laughed with and called a friend. Your spouse and one of your friends may cut it together, double betrayal. It will probably be someone you love dearly, passionately, truly. Some fools even cut the thread themselves. I’ve been the thread-cutting fool, and I’ve been the one left with the shards. Clean it up, box it up, throw it all away–these are all dignified ways to handle the shards of glass. People will politely look away long enough for you to sweep up your mess. Some will even murmur that maybe you should’ve made a rod iron chandelier in the first place. Under no circumstances should you ever sit and stare at the mess or try to organize it in piles of colors that make sense to you. People will assure you that’s a waste of your time and heart. But remember it’s YOUR mess. You can do what you want with the shards. You can slowly pick up each piece and create a mosaic if you want to. This photo was taken in our driveway, on the day I asked about his ring. We don’t usually know the pain and stories behind a simple, beautiful photo.